The 72-storey Rose Rayhaan by Rotana in Dubai is not only the tallest hotel in the world, it is the latest addition to Rotana’s alcohol-free brand. 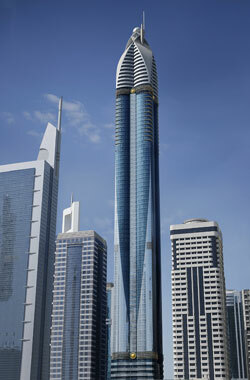 The Abu Dhabi-based hotel chain opened the 333-meter tall Rose Rayhaan to the public on December 23. It has more than 480 rooms, suites and penthouses, all with their own kitchenettes and high-speed internet, plus three restaurants, eight meeting rooms (for up to 160 delegates), a fitness centre, sauna and steam rooms, and an outdoor swimming pool. It’s a tough time to open a hotel in Dubai, and the challenge may be increased by the fact that the hotel is dry – no alcohol is served in its restaurants. The hotel is on Sheikh Zayed Road close to the DIFC metro station, the Dubai International Financial Centre and World Trade Centre. Dubai International airport is 15km away, and Dubai Media City and Internet City are 7km away. Readers should note that Business Traveller has previously reported on the Park Hyatt Shanghai, which has a reception on the 87th floor, and the new Ritz-Carlton in Hong Kong, which will have a lobby on the 102nd floor when it opens in the spring, but both of these properties occupy only a few floors of these buildings, while the Rose Rayhaan by Rotana takes up the whole building, making it the tallest hotel in the world, rather than the highest. Rotana manages 68 properties throughout the Middle East including Rotana Hotels and Resorts, Centro Hotels by Rotana, Rayhaan Hotels and Resorts by Rotana, and Arjaan Hotel Apartments by Rotana. Visit rotana.com for more information.